Human being is not spared from a broad-ranged emotional state, including being jealous. Jealousy has both affective-cognitive and behavioural-evaluative dimension where the person perceives, or experiences a real threat on a valued relationship. As this complex emotion becomes irrational and not amenable to reason, it later transforms into a dangerously ‘green-eyed monster’. This perilous situation which is viewed as pathological jealousy is a form of delusion, which is maintained by a fixed and false reasoning in an originally entrusted intimate relationship. Pathological jealousy is equally prevailing among both gender, and with a greater ubiquity among the geriatric population. 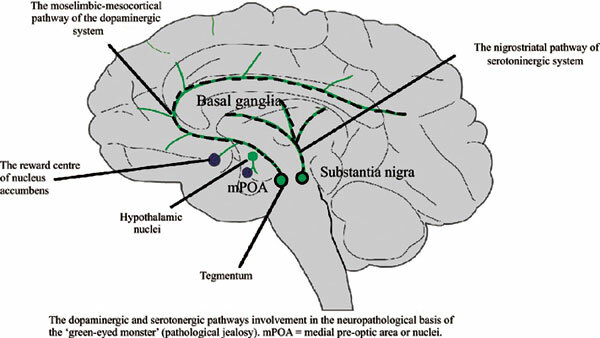 The role of dopamine hyperactivity in the fronto-parietal-temporal region was implicated, with the anatomical mapping of the ventromedial prefrontal cortex (vmPFC), cingulate gyrus (CG), and amygdala involvement in the context of the disease’s neurobiology. The etiology of pathological jealousy includes major psychiatric disorders, i.e. delusional disorder, schizophrenia, mood disorder, organic brain syndrome, and among others, the drug-induced psychosis. The role of relationship issues and psychodynamic perspective, i.e. psychological conflicts with dependence on a romantic partner, and low self-esteem are involved. Pathological jealousy inherits high-risk forensic psychiatry entanglement, which may warrant intensive intervention, including hospital admission and antipsychotic treatment. Treatment options include an early recognition, managing underlying neuropsychiatric disorders, psycho education, cognitive psychotherapy, and choosing an effective psychopharmacological agent. The management strategy may also resort to a geographical intervention, i.e. separation between both persons to complement the biological treatment. Pathological jealousy, green eyed monster, pharmacological and geographical perspective.